Phototherapy, also known as light therapy and light box therapy, is the use of light to treat disorders. It has been classically used to treat both seasonal and non-seasonal depression and may also be effective for people with bipolar disorder. Light therapy has also been used to treat sleep disturbances, schizoaffective disorder, and premenstrual syndrome. 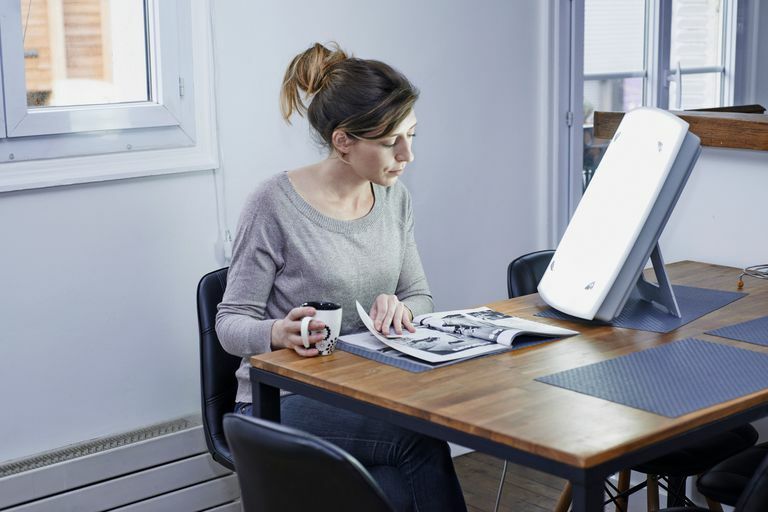 Light therapy generally involves full-spectrum bright light exposure directly onto the eyes using a light source, such as a light box or a light visor. With a light box, the patient sits in front of the light while a visor allows for more mobility. Light therapy is used to treat the depressive episodes of bipolar disorder. Therefore, it's important that a person has anti-manic coverage while undergoing light therapy. A person with bipolar disorder should not undergo light therapy without first discussing carefully with their physician. Whether light therapy is beneficial depends on proper dosing. The dose is determined by the intensity of the light, the distance a person is from the lightbox, and the duration of light exposure. It's interesting to note that people with rapid cycling bipolar disorder may respond better to midday light, as compared to morning or evening light. The advantages of light therapy include the fact that it is rather non-invasive with relatively few and minor side effects. Additionally, a significant number of people respond very quickly to this treatment. The disadvantages of light therapy comprise the daily commitment of time and investment in the equipment. Some healthcare providers have light boxes available in their offices, but this necessitates a daily visit to the doctor. There are also companies that rent the equipment. However, insurance does not always cover the expenses associated with this type of treatment. Also, relapse of symptoms may occur after cessation of treatment. Potential side effects of light therapy include eye-strain, headaches, agitation, and insomnia. Insomnia may be reduced by scheduling the sessions in the morning. Also, the potential side effects may be lessened by using a variation known as dawn simulation, in which the intensity of the light is increased slowly as if the sun were rising. In some cases, symptoms of mania appeared to be initiated by this therapy. In this case, light therapy may need to be temporarily discontinued, or the dose may need to be reduced. In very rare cases, some women reported menstrual irregularities during treatment. It's important to note that light therapy is a medical treatment. Before undertaking this type of therapy, be sure to discuss it with your healthcare provider to make sure it's right and safe for you. Oren, DA, Cubells JF, & Litsch, S. Bright light therapy for the schizoaffective disorder. Amer J of Psychiatry. 2001 Dec;158(12):2086-7. Pjrek, E et al. Menstrual disturbances a rare side-effect of bright-light therapy. Int J Neuropsychopharmacol. 2004 Jun;7(2):239-40. Sato, Toru. (1997). Seasonal affective disorder and phototherapy: A critical review. Professional Psychology: Research and Practice, 28, 164-169. Sit D, Wisner KL, Hanusa BH, Stull S, & Terman M. Light therapy for bipolar disorder: a case series in women. Bipolar Disord. 2007 Dec;9(8):918-27. Steiner, M. & Born, L. (2000). Advances in the diagnosis and treatment of premenstrual dysphoria. In: Managing depressive disorders by Katharine J. Palmer and Chung Kwai. Hong Kong: Adis International Publications, 139-57. Can Verapamil Be Used To Treat My Manic Episode? How Can Anticonvulsants Help Treat Mania in Bipolar Disorder? How Often Do People With Bipolar Disorder Cycle?